Golfers seeking additional knowledge about a golf course, regardless of their frequency of play, will often times lean towards a GPS or rangefinder. This has sparked some excellent products over the last few years, coming in various shapes, sizes, and configurations. Leading the Japanese market for many years, Shot Navi has come to the United States golf market with the phrase “Shot Navi will support your golf life” providing precision and options for every player. As their number one selling unit, the W1-GL provides availability to thirty thousand golf courses in eighty countries across the world. Coming in both black and white, with the ability to rotate between a black background and white background, the profile can be customized enough to accommodate visual preference alongside easily readable content during sunny and cloudy days on the course. This comes alongside a package under seventy grams, and an eagerly boasted battery life. 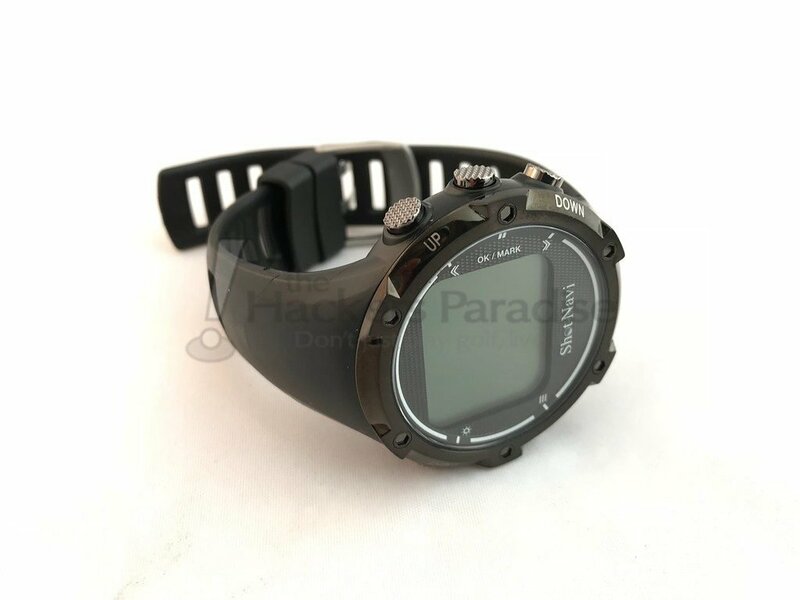 Not unlike many of the traditional GPS watch shapes, the most obvious variance between the W1-GL and a typical watch is the depth of the display portion of the watch. Until a company comes into the industry and redesigns the profile or rebuilds the technology, this is something that should be expected, and hardly detracts from the early thoughts of the device as it is quite average in that regard. The eyes quickly move to the other components of the watch, such as the rough button profile which promotes a rugged and durable experience, along with the band that presents many width offerings for wrist comfort. 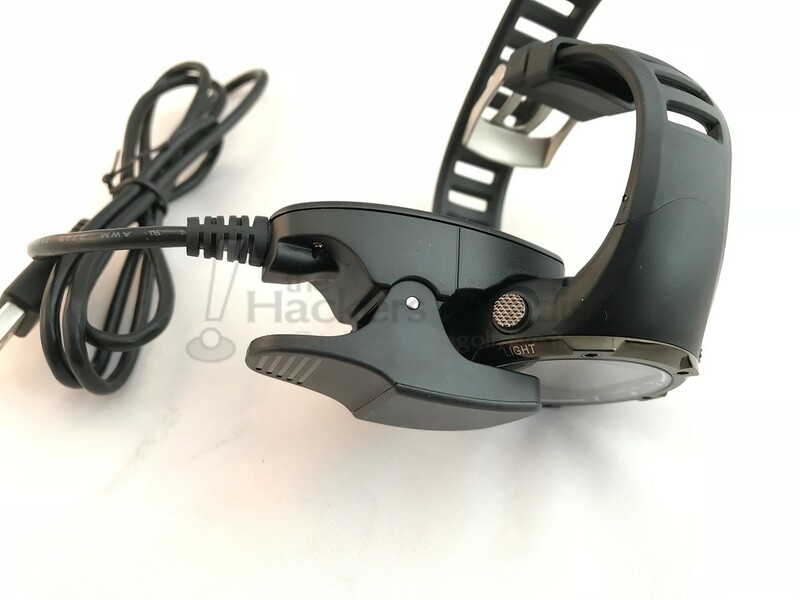 The band becomes quite rigid as it flows into the face, which will not be problematic for medium to large wrist sizes as it does frame the wrist well overall. The display itself has a boxed profile, surrounded by a white circle and Shot Navi logo to flow better into the round shape of the watch. This is framed by a black outer portion (silver on the white model) to blend into the buttons and add some durability. The first takeaway of the watch, one that is quite common for golf GPS watches, is the black and white display being a bit archaic as a whole. In a digital world of devices, it is a bit of a contrast from the typical high graphics of smartphones and smartwatches, but nevertheless, makes perfect sense in its form due to the lack of necessity for that type of bell or whistle. In many ways, this likely leads to improved battery life, which is far superior to a bit of flash only to fall short of a full round of golf. The detail provided by the W1-GL is excellent. Golfers are provided with a display that shows the present hole, par, and distance to the selected location on the green. Rudimentary graphics representing bunkers, water hazards, and front/middle/back of green distances are provided as the user cycles through the visuals, which can be beneficial when navigating the various trouble areas on a particular hole. Based on the different outputs provided, this also means the size of the distances are displayed slightly different, yet Shot Navi has made it possible to allow the golfer to customize (in a way) depending on whether they want big numbers and limited data, or smaller numbers with all the detail the hole can provide. 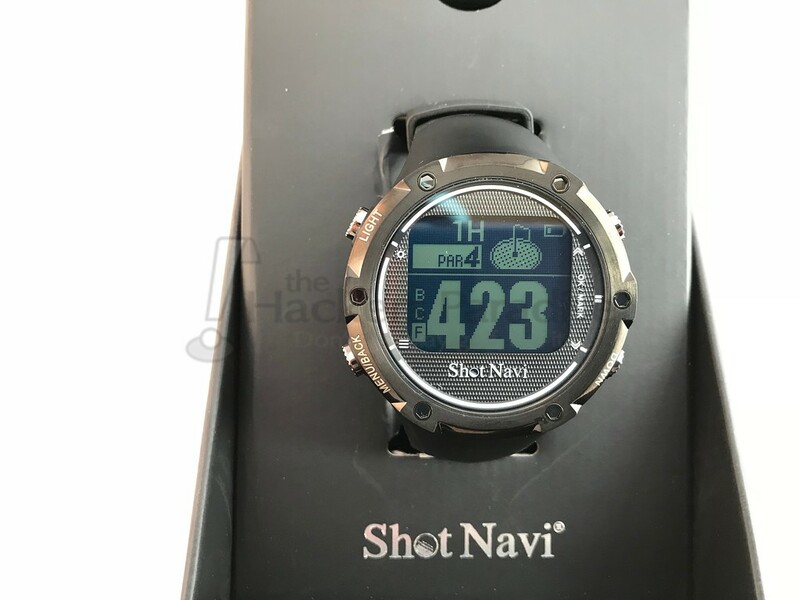 Moving past the static numbers, Shot Navi also provides the golfer with the ability to keep their score and number of putts, track distances of shots at the click of a button, and once again customize the display to output white background or black background. Overall, the unit really is not lacking any function that a regular golfer would need to feel empowered on a golf course, beyond a touch screen that could navigate the hole and present distance scenarios (does not sound realistic to expect, does it?). At the start of the round, the Shot Navi searches for the nearby golf course using the menu option, which takes a few minutes in the “search satellites” screen. When the round is completed, or there is a pause in the round, golfers can either suspend or stop the Navigation. So, what is lacking at this particular price point? It really is a matter of preference. As the number one wearing golf GPS from Japan (according to their Amazon listing), it seems that many believe this unit provides everything that could be included in a watch in a very reasonable price (currently listed at under $150 shipped). Offering the W1-GL in white, as well as other units that look different and offer other features (see Dean’s review of the HuG) as well as non-wrist options (see James’ review of the Handheld N2), Shot Navi gives golfers a chance to customize to their needs while receiving that important depth of course knowledge that is required to score better and make smarter decisions while playing. For more information on the W1-GL from Shot Navi, or to take a look at their other GPS offerings, visit http://shotnavi.net/en/. Excellent review Dan. Sounds like this unit produces all the useful, needed information and it comes in at a very reasonable price point. Excellent write up Dan! This looks like a quality offering at a very competitive price point. The display looks easy enough to understand and operation seems pretty straightforward. Solid review Dan, I’m always a bit leery of the brands I don’t recognize so reading this is the number 1 unit in Japan makes me look at with a more open mind. I like the features as far as data and ability to adjust screen for the sun/cloud aspect. Another solid unit at less than $150 without question. Not being familiar with this brand but reading that is the number 1 watch in Japan is good to know. The ease of navigation and the pricepoint are big sellers for me.